A recent survey by the British Computer Society found that digital transformation was a top 3 board-level priority for 25.8% of respondents and a top 3 C-level priority for 45.4%. Organizations are making digital transformation a top priority as they rethink their business models, processes, products and services to create compelling new value propositions for customers, grow revenues and streamline operations. For leading organizations, it’s about thriving in the era of digital disruption and innovating for growth and efficiencies. For many others, it’s about survival and developing strategic countermeasures to proactively avoid being disrupted by the competition. Industry competition, of course, is nothing new. However, digital disruption has been accelerating the pace of change and leaving a wake of corporate devastation in its path. As an example, whereas 89% of the Fortune 500 went out of business between 1955 and 2014, in recent years, according to R “Ray” Wang of Constellation Research, a staggering 52% have been merged, acquired, gone bankrupt or fallen off the list solely since 2000. Take the retail industry for example. The recent “retail apocalypse” has claimed 39 high-profile retail bankruptcies since 2015 alone – including the recent closure of Toys R’ Us, impacting 800 stores and over 30,000 workers, after the company failed to emerge from bankruptcy. All in all, over 7,000 stores closed in 2017 in the U.S., with apparel and electronics accounting for nearly half of the closures. While digital disruption of business models, products and services is well-recognized, what’s less known is that many internal corporate planning processes are ripe for disruption as well. These are processes that we often consider to be timeless and untouchable. Strategic planning and business case development are some of the latest corporate processes beginning to feel this disruption. 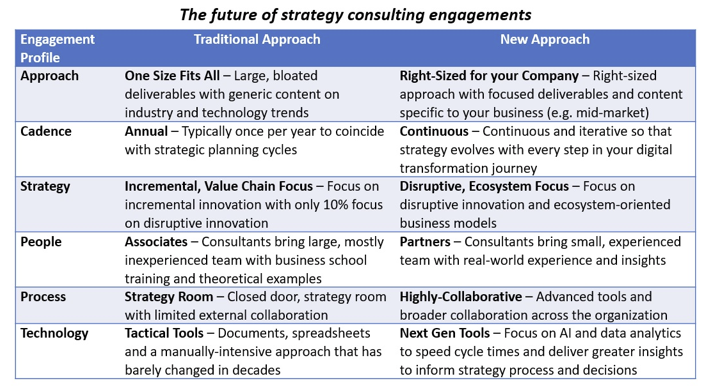 With the increasing pace of change, annual strategic planning processes are ceasing to keep up and are leaving companies with much of the existential threat that their strategies are supposed to avoid. Just as IT has re-invented itself to become more agile and responsive with techniques such as agile, DevOps and everything-as-a-service, corporate strategy also needs to re-invent itself to be equally agile and iterative. If we compare the traditional approach to strategy with the new approach, we see changes across the board in overall approach and cadence as well as to the people, process and technology utilized to perform activities, craft deliverables and unlock value (figure 1). The new approach to strategy that we envision integrates it more tightly with upstream corporate innovation processes and with downstream execution so that strategy can help to guide innovation, innovation can help to inform strategy and innovations can be successfully launched at speed and at scale. It replaces annual efforts that coincide with strategic planning cycles with continuous and iterative activities so that strategy evolves with every step in your digital transformation journey. It replaces closed-door strategy room meetings with more collaborative approaches that involve a broader set of stakeholders across your organization. It replaces manually-intensive processes with advanced tools and digital transformation workshops for fostering greater consensus and buy-in. The new approach to strategy replaces large, over-inflated deliverables with laser-focused plans and roadmaps specific to your business, your financials and the way you operate. Finally, it replaces tactical consulting tools such as documents and spreadsheets with more strategic tools employing AI and advanced analytics to speed cycle times and deliver far greater insights to stakeholders and decision makers. ClearPrism’s mission is to help you thrive in an era of digital disruption. We were founded by seasoned consulting, digital transformation, technology and software professionals who have spent all their careers helping clients through many successful digital transformation initiatives. 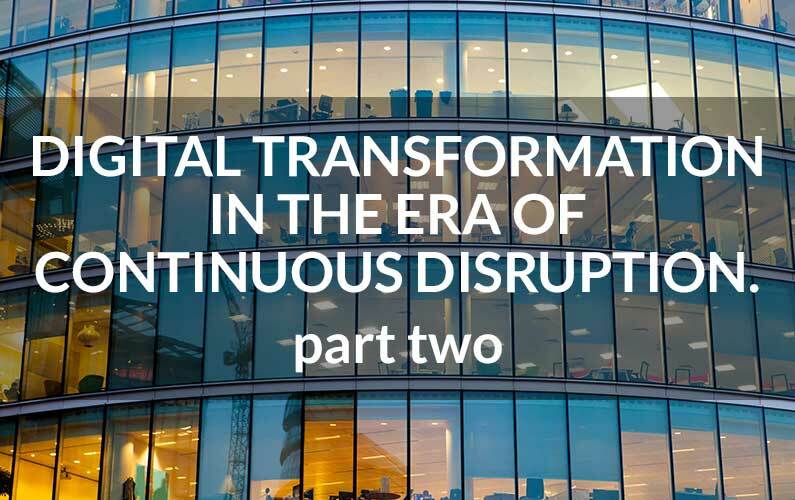 Understanding that industry experts agree that most digital transformations are considered either unsuccessful or outright failures, our goal is to help clients move beyond simply surviving digital disruption, but to actually thrive with newly sustainable advantage. For strategy and business case development, selecting the right partner can mean the difference between success or failure. The right partner is the difference between maintaining the status quo or moving forward. The right partner is the difference between losing customers and competitive advantage or creating new value that the market and your customers seek. Where most consultancies look at client projects as simply engagements, we look at our work as creating a new, achievable and valuable future for our clients. We’re pioneering this new approach to strategy as part of our CLEARADVOCATE service line. Our unique and differentiated approach is designed to bring partners, not just associates, to your engagements. Our partners work with you throughout each engagement as opposed to disappearing right after project kick-off. We bring a right-sized approach focused on your specific company (e.g. the mid-market) and industry and deliver work products that are tailored to your company, your financials and your organization. Our strategy deliverables bring innovative thinking, apply that to what works in the field, and consider how you will orchestrate your transformation. Our business case deliverables go far beyond typical ROI models and look at how each alternative will impact your financials and the specific ways you undergo financial reporting. In this way, your strategy materials can live on and be utilized throughout your implementation journey as opposed to living on a shelf in the corner office. On each assignment, we focus on innovative thinking coupled with execution that outperforms, so that you can realize benefits that exceed expectations. We encourage you to join us in rethinking strategy in the era of digital disruption and helping your organization thrive.